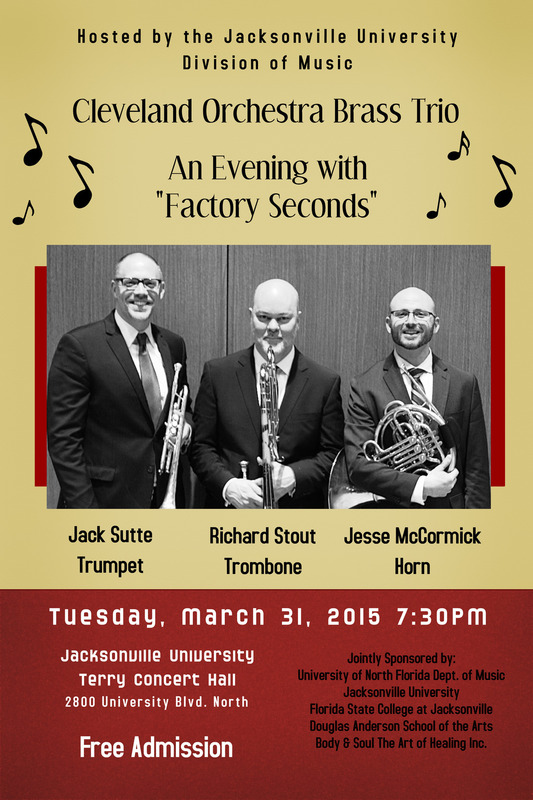 The Cleveland Orchestra’s Factory Seconds Brass Trio will perform a program titled “An Evening with Factory Seconds.” The trio is an innovative collaboration of brass faculty at Baldwin Wallace University Conservatory of Music in Berea, Ohio. The ensemble consists of Cleveland Orchestra members Jack Sutte, second trumpet, Jesse McCormick, second horn, and Richard Stout, second trombone. The concert is jointly sponsored by these local institutions: Jacksonville University, the University of North Florida Department of Music, Florida State College at Jacksonville, Douglas Anderson School of the Arts and Body & Soul The Art of Healing Inc. 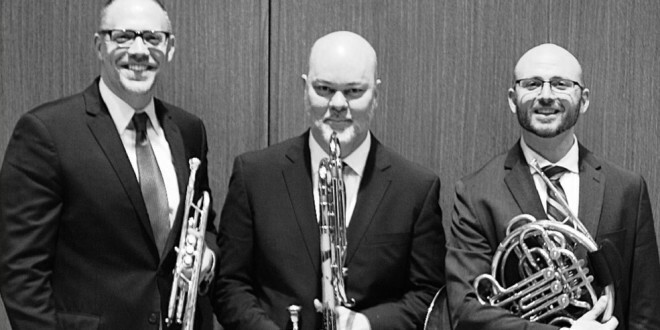 The Factory Seconds have performed at numerous educational and community outreach programs, traveled regionally and nationally as ambassadors for the Baldwin Wallace Conservatory, commissioned new works for brass trio, and have begun recording some of their repertoire. A keen interest for the group is in finding not only new music, but also new performance situations and audiences. Factory Seconds seeks to identify and perform music of our time, and has commissioned and premiered works of promising young composers, including Clint Needham, Robert Pound, and Matthew Barbier. For 2015-16, the trio plans to continue to perform in both traditional and unexpected venues in and around Cleveland, Ohio, including concerts at Baldwin Wallace and the Western Reserve, as well as concerts and master classes in Florida and Pennsylvania. For more information, contact Artie Clifton at aclifto@ju.edu or (904) 256-7386.